Seating is limited. You may purchase tickets online through the Drexel Theatre, by calling the theatre at (614) 231-9512, or purchasing them at the box office. 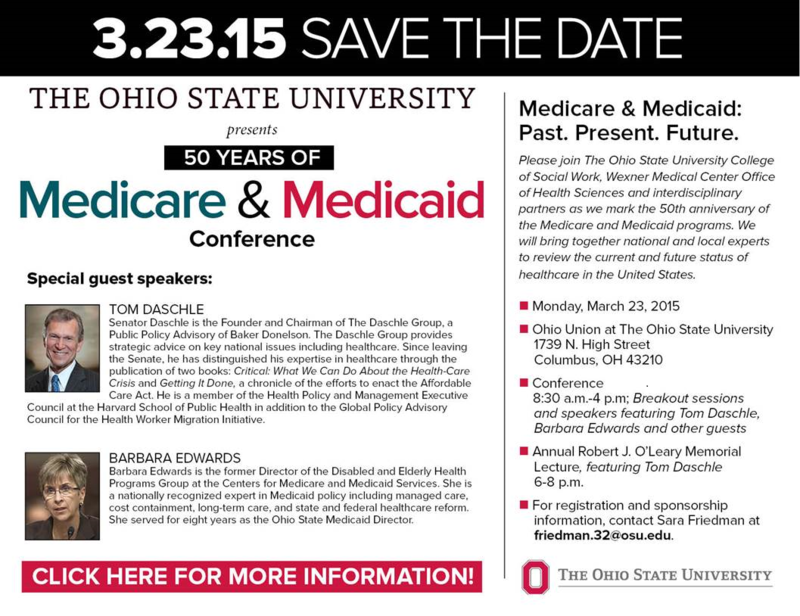 The College of Social Work at The Ohio State University is sponsoring a presentation by Tom Daschle and Barbara Edwards on Medicare and Medicaid. For more information, see flyer below. Additional information is available on the College of Social Work website. The students will attend the OAGE conference, which will be held in Bowling Green, Ohio on April 24th, 2015 at Bowling Green University. If you plan to attend the OAGE conference, don’t forget to seek these students out to learn more about their papers! Topics in Gerontology: New Modules Released! These modules are intended to provide education about preventing vision loss. Some of the topics cover how the eye functions, age-related diseases that commonly affect the eye, risk factors for eye disease, eye care benefit options other than employee health care, and how to become more involved in advocating for eye care services for older adults. The growth of the aging population and subsequently, the increase in the incidence of vision loss and blindness, will tax our current health care system greatly. Because of this, we expect to see formal and informal caregivers play a larger role in caring for our older population in the coming years, and preserving eyesight should be part of all older adult's care. For more information about the future of vision care, review the Prevent Blindness Future of Vision website. More about Prevent Blindness . . . Founded in 1908, Prevent Blindness is the nation's leading volunteer eye health and safety organization dedicated to fighting blindness and saving sight. Their mission is to prevent blindness and preserve sight. To meet this mission, Prevent Blindness trains and certifies volunteers who provide vision screens for millions of children and adults each year. They also educate the public about the importance of early detection of eye disease and the prevention of vision loss, advocate to improve vision health polices, and support groundbreaking vision research. To learn more about Prevent Blindness, visit their website.